﻿ Botti Floor Lamp Is Featured In This Mid-Century Project! Botti Floor Lamp On Full Display! Today we will give you another rendition of Mid-Century Projects. Today we have a mid-century residential project deep in the heart of France. With a modern floor lamp on full display, Botti floor lamp, that is the heart and soul of this mid-century project. Diff. Studio designed a mid-century project deep in the heart of France, and we are here to tell you everything about it. A private residence in France, this mid-century modern apartment features all the luxury that the mid-century modern style has. Here you can perfectly see that mid-century influence in the living room decor. With Botti floor lamp taking center stage, this mid-century modern living room features a perfect blend of classic and modern. Of course, there are other lighting pieces that were used to achieve that mid-century influence, for instance, Botti table lamp and Turner wall lamp help recreate that mid-century touch in the most faltering way. 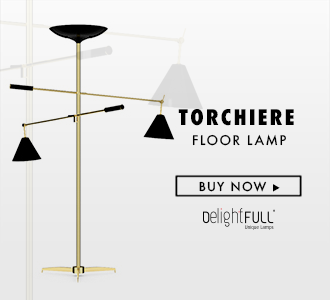 But we are not here to talk about any other lighting pieces than Botti floor lamp. A mid-century inspired floor lighting piece that was inspired by the great modern trumpeter Chris Botti. A piece that features a luxurious and coveted design. If you are looking for that mid-century spark, then Botti floor lamp is the right lighting piece. Botti floor lamp is able to fit well in almost any room imaginable, perfect to mix with a more luxurious setting, this piece of mid-century lighting design is definitely one of our favorites.